Complex networks are being touted as the next scientific revolution of the new millenium. Led by a spate of sparkling discoveries by Prof. Barab? ?si and his team of researchers at University of Notre Dame, the study of complex networks has seen a tremendous rise in interest among biologists, physicists, computer scientists, economists and sociologists alike. The study of networks is no longer being seen as restricted to computer science. Instead, it has percolated into a vast array of seemingly unrelated disciplines of science. This paradigm shift has been brought about by means of the discovery that many diverse systems in nature can be described as complex networks which are actually very similar to each other. Behind most complex systems there exists an intricate network consisting of innumerous nodes connected to each other by links. Understanding this network is a crucial prerequisite to understanding all of these systems. This research has had a rather long incubation period, during which time networks were believed to be fundamentally random. The random model introduced by Erd?¶s and R?©nyi was long thought of as the basis of all complex networks. That theory postulates that nodes in a network randomly link to each other. However real networks, like the internet, the cellular network and the social network, all have special nodes, called hubs or connectors, which are connected to most other nodes in the network. The random model failed to describe the existence of these hubs. The breakthrough was brought about, in the very recent past, by Barab? ?si, who discovered that the World Wide Web was in fact a scale-free network following power law distribution of nodes vs. degree. This was followed by a spate of discoveries by scientists from various other fields. Independent discoveries concluded the realization that a similar scale-free topology exists in the genetic network of living organisms, the social network of people and their social links, the economic network of business organizations, and many other networks like that of scientific citations, terrorist networks, and viral networks. Barab? ?si has presented a vast amount of information in the most palatable of forms, leaving out the mathematical details and avoiding scientific jargons of any form. The text is abundantly interspersed with anecdotes and stories, for example, the “seven bridges” problem of Konigsberg which inspired the legendary mathematician Leonhard Euler to create the first graph and lay the foundation for modern graph theory. Many seemingly unlikely analogies are drawn primarily to pique reader interest, for example, between the Denial-of-Service attack on Yahoo and the spread of Christianity by St. Paul in the first century AD, or between Bose-Einstein condensation and the fitness-model. Explanations based on network theory are offered for several recent phenomena of great relevance, for example, the terror attack on the World Trade Center by the terrorist networks and the spread of sexually transmitted diseases like AIDS across the sexual network. 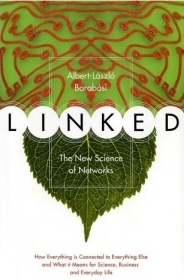 In the words of the author, the book “has a simple aim, to get you to think networks.” Towards that end, it provides the reader with an exhilarating foray into the fascinating world of complex networks and is bound to spark off many more amazing discoveries heralding a new scientific revolution.